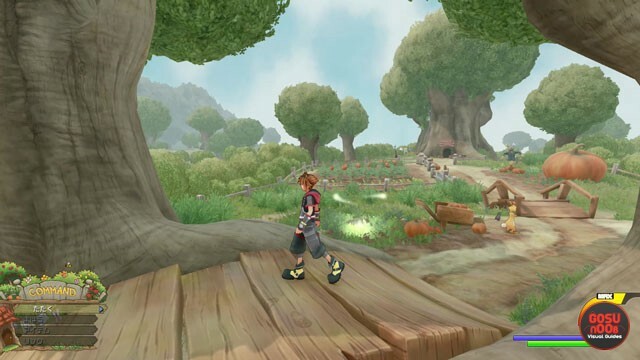 100 Acre Wood Lucky Emblems in Kingdom Hearts 3 are a hidden collectible you can find. Like in the other maps, the Lucky Emblems in 100 Acre Wood are in the shape of a Mickey Head. There aren’t many Lucky Emblem Mickey Heads, but they’re fairly well-hidden. Luckily, all the Lucky Mickey Head Emblems in 100 Acre Wood are grouped together pretty closely, making the search a bit easier. Still, you might have a little trouble with them. So, our Kingdom Hearts 3 100 Acre Wood Lucky Emblem Locations will show you where to find all 3 Mickey Heads in Winnie the Pooh’s world. Where to Find Mickey Head KH3 Lucky Emblems in 100 Acre Wood? To find all the Lucky Mickey Head Emblems in the 100 Acre Wood, you first have to go to the area called “Rabbit’s Howse”. Conveniently, all three emblems are in that area. The first one is right in your line of sight from the fast travel point. If you look at Rabbit’s garden, you’ll immediately spot a giant pumpkin. The Mickey Head is on the pumpkin; on the side opposite of the rabbit-shaped scarecrow. The second Mickey head is a little trickier. Go to the right from the fast travel point (left if your back is to Rabbit’s house), towards the Heffalump (the little purple elephant). Look off to the distance, and you’ll see a tree in the shape of the Lucky Emblem. So, snap the pic. You might have to maneuver a bit in order to get it into frame properly. The third and final Lucky Emblem in the 100 Acre Wood is also the best-hidden one. Walk over to Rabbit’s House, and look to the left. You’ll spot a bunch of clothes hanging on the clothesline. There are also two buckets. One is next to the house, under the drainpipe, and full of water. The other bucket, further from the house and next to the pink towel, is empty. Or, that’s how it seems. Look into the empty bucket, and you’ll spot the Lucky Emblem inside. It’s formed by three water stains, turns out. If you need help with with any of the other Lucky Emblems in the other zones, feel free to check out our other Kingdom Hearts 3 guides. Among others, we have Toy Box Lucky Emblem Locations, Monstropolis Lucky Emblem Locations, and Arendelle Lucky Emblem Locations – Hidden Mickeys.